The Brightspace Pulse app can deliver course information to students in real time, freeing teachers from the responsibility of "reminding" instead of teaching. Brightspace Pulse can keep students up-to-date on their workload, assignments, schedules and grades for all of their courses. A new mobile app that can supply students with course information in real time has been launched by D2L (formerly Desire2Learn). 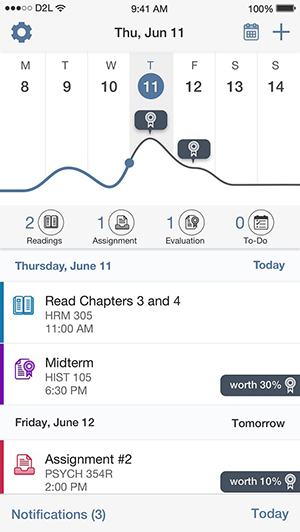 The new app, Brightspace Pulse, allows instructors to quickly inform students of their workload, schedules and grades in an effort to help them manage their study time and priorities. In addition, teachers can deliver real-time alerts and notifications directly to students' mobile phones. Students have the ability to check on the readings, assignments and tests they have coming up. They can customize their workload views by the week, month or term to get a better perspective on what they have achieved and what they still have to accomplish academically. The app also includes a way for them to "check off" assignments and tests that have been completed. Teachers can make students' grades available to them via the app as well, which can remain private or can be shared with fellow students via other applications like e-mail, Message, Evernote, Twitter and Facebook. D2L officials said the app will give teachers the opportunity to spend less of their time "reminding" students of tasks to be accomplished and more time teaching. "Students told us they expect more when engaging with their teachers and institutions," said D2L CEO John Baker. "Brightspace Pulse delivers what they need in real time."